The Throne of the Seven Kings! Quite when or why stones became associated with the coronation of monarchs may be impossible to know. According to the eleventh edition of the Encyclopaedia Britannica, in pre-Christian Europe ‘the king or ruler, upon his election, was raised on a shield, and, standing upon it, was borne on the shoulders of certain of the chief men of the tribe, or nation, round the assembled people. This was called the gyratio, and it was usually performed three times’. If the adoption of coronation stones is a Christian innovation, then it seems an oddly pagan one. And if the stone somehow linked or bound the king to the soil of his native land, was the origin of the stone important or would any old rock do? Kingston’s association with English monarchs goes back to around 838, when Egbert, King of Wessex, held a Great Council there. The town’s Anglo-Saxon name, Cyningestun, or ‘King’s Place’ implies a much earlier royal connection. But the first attested coronation at Kingston wasn’t until 925, when Athelstan chose to be crowned there as King of the united kingdoms of Wessex and Mercia. The location was significant: this was where Wessex on the south bank of the Thames met Mercia on the north bank. Athelstan was the first English King to be crowned, indeed the first to wear a crown, and the ceremony was led by the Archbishop of Canterbury, Athelm. Kingston is where the traditions of English monarchy began. Kingston’s Coronation Stone is a sarsen, a type of stone found across southern England, most famously in Wiltshire, where sarsens were used in the construction of Stonehenge. It was set on its present plinth in its present enclosure in 1850, amid much celebration and ceremony. The names of seven tenth-century kings, one of them, Edward the Elder, Athelstan’s father, were inscribed on the plinth. The evidence of a Kingston coronation for some of these men is scant or non-existent, which is not to say that the tradition is wholly invented. The consecrations are thought to have taken place in St Mary’s, an ancient chapel which collapsed in 1730, on the north side of the town’s Market Place. The Stone was pulled from the rubble of the chapel and was used for a while as a mounting block in the Market Place before its municipal re-consecration in 1850. The Coronation Stone appears a forlorn and isolated monument today, sited at the edge of the dour Council offices complex. The silver coins from each of the seven king’s reigns embedded in the base have been joined by dozens of copper coins thrown onto the plinth, presumably a local wishing custom and a sign that there may be some residual belief, however attenuated, in the occult power of the Stone. Then again, it could all be ironic. There was talk a few years back of re-siting the Stone by All Saints church, close to the former site of St Mary’s, using National Lottery funding, though these plans seem not to have progressed. The coronation of the next British monarch, whenever that happens, will in large part be a religious ceremony, though the belief in the divine right of kings was ditched long ago and the notion of the monarch as God-anointed is now a minority view. Britain’s other coronation stone, the Stone of Scone, now sits in a museum, a sure sign that it has been de-sacralized. 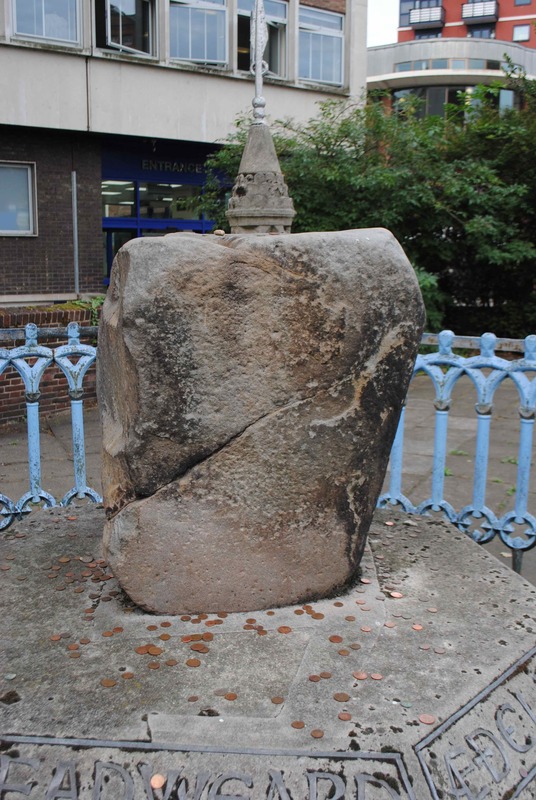 Kingston’s Stone is not yet a museum piece: it remains embedded in the town’s topography, it retains its imaginative power, it speaks to us of the long narrative of English history.